As well as their substantial benefits especially in prevention and treatment of diseases, injection practices in medical settings can harm the recipients because of reuse and overuse of injection equipment (resp. [respectively] the lack of new injection equipment). Affected people and foundations of life: Almost 40% of the 16 billion injections administered worldwide each year are given with syringes and needles that are reused without sterilization (WHO [World Health Organization] 2008, 44). Contaminated injections annually cause about 8-20.6 million cases of new hepatitis B infections, 2.0-4.7 million cases of hepatitis C infections and 80 000 to 260 000 cases of HIV (Human Immunodeficiency Virus) infections (hepatitis is a long-term cause of liver cirrhosis and liver cancer; WHO 2004a, 1831; Kane et al. [and others] 1999, 803). South-East Asia is affected the most (WHO 2002, 78). Only 5% of injections are for vaccination, 95% of all injections are therapeutic, of which the majority is judged to be unnecessary (because of oral alternatives, etc. (and so on); Simonsen et al. 1999, 790f. [and following page]). Infections caused by unsafe injections are projected to cost the world more than US$ (dollar of the United States [of America]) 535 million per year in direct medical expenditures (WHO 2008, 44; Miller/Pisani 1999, 808f.). Furthermore, there are risks to health staff by needle-stick injuries and risks to the community through unsafe sharps waste disposal (WHO 2002, 78). Deaths: estimates range from 501 000 to 1.3 million deaths that are annually caused by unsafe injection practices in medical settings; whereby most deaths occur many years or even decades after infection (WHO 2008, 44, 2004a, 1831, and 2002, 78; Miller/Pisani 1999, 808f.). Loss of healthy life-years: estimates range from 10.5 million of healthy life-years (DALYs [Disability-adjusted life years]) up to 26 million years of life lost (YLL, not considering years of disability) annually (attributable to unsafe injection practices in medical settings; WHO 2008, 44, 2004a, 1831, and 2002, 78; Miller/Pisani 1999, 808f.). Targets/goals: no international goal or target. Trend: ? no trend data available. 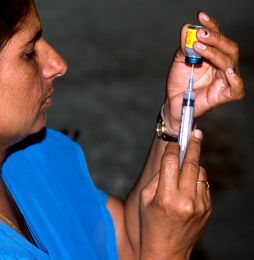 The lower projection of losses in health and lives relies, among others, on the continual increase in vaccination of children against hepatitis B.
management of sharps waste to prevent reuse of dirty equipment and needle-stick injuries (safety-boxes, syringes with needle-stick prevention feature; WHO 2004a, 1840, and 2002, 130f. ; Battersby et al. 1999). Battersby et al. 1999 – A. Battersby, R. Feilden and C. Nelson: Sterilizable syringes: excessive risk or cost-effective option? In: Bulletin of the World Health Organization, 1999, 77 (10), 812-819. Simonsen et al. 1999 L. Simonsen, A. Kane, J. Lloyd, M. Zaffran and M. Kane: Unsafe injections in the developing world and transmission of bloodborne pathogens: a review. In: Bulletin of the World Health Organization, 1999, 77 (10), 789-800.
WHO 2004a – World Health Organization: Comparative Quantification of Health Risks. WHO 2008 – World Health Organization: The World Health Report 2008; Primary Health Care; Now More Than Ever.